The number-one New York Times best-selling author of Small Great Things returns with a powerful and provocative new novel about ordinary lives that intersect during a heart-stopping crisis. The warm fall day starts like any other at the Center - a women’s reproductive health services clinic. Then, in late morning, a desperate and distraught gunman bursts in and opens fire, taking all inside hostage. After rushing to the scene, Hugh McElroy, a police hostage negotiator, sets up a perimeter. Then he finds out that his 15-year-old daughter, Wren, is inside the clinic. I rarely write reviews but this book is so so bad I felt compelled to warn other readers. Usually I enjoy this author but A Spark of Light is trite and adds absolutely nothing new to the discussion on pro-life, pro choice issues. 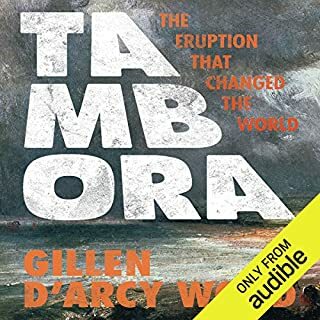 When Indonesia's Mount Tambora erupted in 1815, it unleashed the most destructive wave of extreme weather the world has witnessed in thousands of years. The volcano's massive sulfate dust cloud enveloped the Earth, cooling temperatures and disrupting major weather systems for more than three years. Amid devastating storms, drought, and floods, communities worldwide endured famine, disease, and civil unrest on a catastrophic scale. Would you try another book from Gillen D'Arcy Wood and/or Tom Pile? No. The narration was even worse then the book. What was most disappointing about Gillen D'Arcy Wood’s story? I was really excited about this book and it's the kind of topic that interests me. What a disappointment. Boring, boring, boring, boring. What didn’t you like about Tom Pile’s performance? I rarely write reviews but this book was so bad I felt I needed to warn other Audible listeners. At the very least listen to the sample before purchasing. The most fatal virus known to science, rabies kills nearly 100 percent of its victims once the infection takes root in the brain. 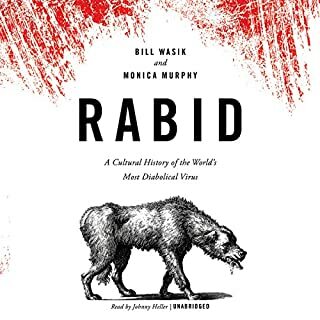 From Greek myths to zombie flicks, from the laboratory heroics of Louis Pasteur to the contemporary search for a lifesaving treatment, Rabid is a fresh, fascinating, and often wildly entertaining look at one of mankind’s oldest and most fearsome foes. My favorite science read this year. What would have made Rabid better? Written a short article on the subject. Would you be willing to try another one of Johnny Heller’s performances? Yes. Good job with a terrible book. This book could have been written in three chapters. History of rabies was so boring I skipped over chapters. The information on Pasteur and his discovery of the rabies vaccine was interesting but If you want to read a book about rabies it would make more sense to spend a credit on a book about Louis Pasteur. Two girls who grow up to become women...two friends who become something worse than enemies. 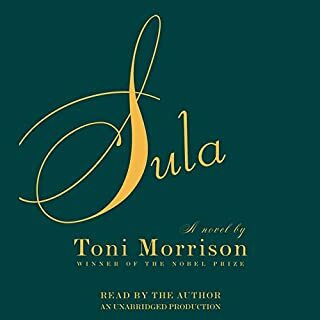 In this brilliantly imagined novel, Toni Morrison tells the story of Nel Wright and Sula Peace, who meet as children in the small town of Medallion, Ohio. Their devotion is fierce enough to withstand bullies and the burden of a dreadful secret. I love Toni Morrion's books and have read several. I purchased Sula and Beloved. What a mistake. She is a terrible reader, slow, wispy, frequent pauses. I suffered through Sula but after the first chapter gave up on Beloved. Listen to a sample of the book, prior to purchase, to evaluate the reading style. It may work for some but it definitely did not work for me. Staring unflinchingly into the abyss of slavery, this spellbinding novel transforms history into a story as powerful as Exodus and as intimate as a lullaby. Sethe, its protagonist, was born a slave and escaped to Ohio, but 18 years later she is still not free. She has too many memories of Sweet Home, the beautiful farm where so many hideous things happened. And Sethe's new home is haunted by the ghost of her baby, who died nameless and whose tombstone is engraved with a single word: Beloved. 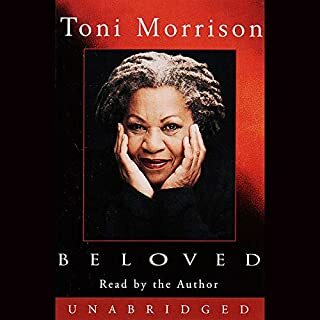 I have read several of Toni Morrison's books and loved her writing. I purchased Sula and Beloved and put Tar Baby on my wish list. I will never purchase a book again without listening to a sample. Toni Morrison is a terrible reader; slow with frequent pauses, and at times difficult to hear what was being read. I suffered through Sula and after 20 minutes gave up on Beloved. I have never made any comments on books purchased, but this was so bad I felt compelled to warn others. 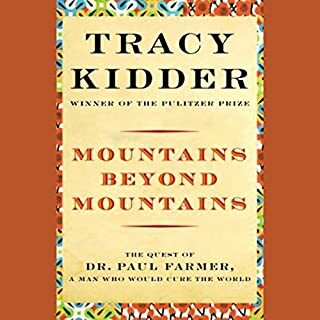 Pulitzer Prize-winner Tracy Kidder tells the true story of a socially conscious genius who uses his intellectual and personal gifts to solve global health problems. Tracy Kidder has written a riveting account of an incredible man who defied conventions to treat the poorest of the poor. 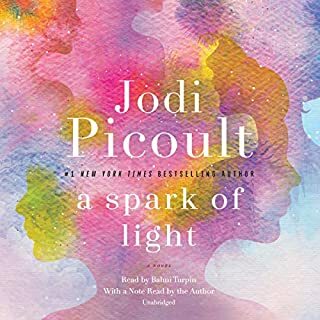 Could not stop listening and am recommending as my book club read. Absolutely the best autobiography I have ever read.